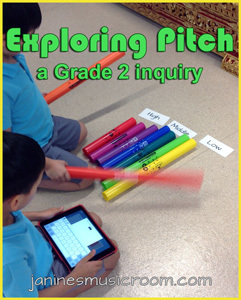 I’ve just started a sound exploration unit in Grade 2, focusing on pitch (and later, duration and dynamics). Last week was an introduction week, where the students tried singing from graphic notation. What began as the same up-and-down siren sound over and over gradually evolved into awareness of how to have better accuracy: where it starts, where it ends, the size of the pitch change, etc. Once they were looking at the squiggly lines with sharper eyes, they were able to take some dictation. The students loved this challenge, and for most, they already knew what to do by the time they got to the last station. After they explored the four stations, documenting their findings and conclusions in their individual student blogs, we came together to create a rule for instruments in general. But what happens when the instrument isn’t so obvious? Next we will move onto guitars, ukuleles, and recorders. Now how will our rule change? Or how can we apply our rule to these instruments? 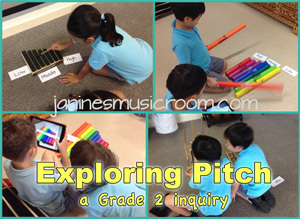 It gets loud, but we know that students love to explore instruments. Sometimes the best inquiry comes from having a messy and chaotic class (as long as they are handling the instruments carefully and responsibly). The students were really engaged in this lesson, and they were excited about following the instructions and coming up with their own rules. 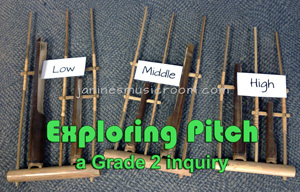 What are your most successful ways of learning about how we can alter pitch?